It's that time of year again. Most of the nation's big banks have disclosed how much chief executives earned in 2012. While some had their compensation cut, others received hefty raises. One caveat: Wells Fargo (WFC) CEO John Stumpf, who received $17.6 million in total compensation in 2011, is not on the list. Wells has not yet disclosed Stumpf's 2012 compensation. The CEO of Goldman Sachs (GS), took home a pay package totaling $21 million. On top of his base salary of $2 million, Goldman Sachs' board granted Blankfein a nearly $19 million bonus: $13.3 million in stock and $5.6 million in cash. 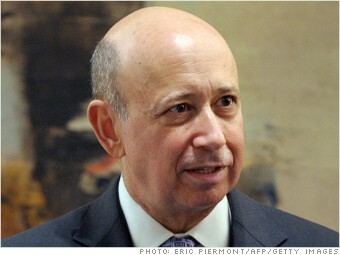 In 2011, Blankfein received total compensation worth $12 million. He wasn't the only one who got a raise last year. The other top four executives at Goldman were paid base salary and bonuses worth a combined $71 million. 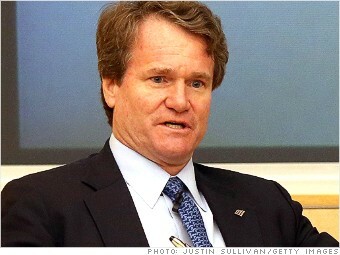 Bank of America (BAC) shares doubled in value last year, and Moynihan was rewarded with a big pay raise. The CEO was granted $11.1 million in restricted shares for 2012. Including his base pay, Moynihan received a total pay package of just over $12 million. The compensation package is much larger than the prior year, when Moynihan was paid $7 million. Moynihan's windfall came as shares of Bank of America rallied from less than $6 in January 2012 to nearly $12 at the end of the year. Citgroup paid its new CEO $11.5 million in 2012, including one of the few cash bonuses doled out to top Wall Street CEOs last year. Corbat, a 29-year veteran of the bank, took the helm after Vikram Pandit stepped down in October. Pandit, who received $6.7 million for his efforts in 2012, was the first CEO of a major bank to have his pay package voted down by shareholders in 2011. 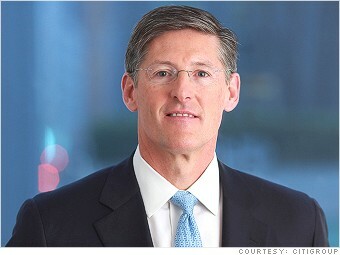 Citi (C) has restructured the way it pays top executives. Instead of deferred cash compensation, 30% of their pay last year came in the form of "performance share" stock grants, which won't be paid out for another two years. The goal is to strengthen the link between CEO compensation and how well the company performs. Corbat is due to get up to $3.1 million on that score. Despite having his bonus cut in half, Dimon took home a total of $11.5 million in 2012. 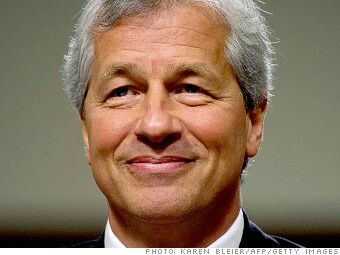 Dimon's compensation included a $10 million bonus, down from $21.5 million in 2011, when he was the best paid bank CEO. The decision to slash Dimon's bonus was in response to the $6.2 billion loss JPMorgan (JPM) suffered on the so-called London Whale trade. Dimon said the losses on credit derivatives were due to "sloppiness" and "bad judgment." JPMorgan's board also decided to push back Dimon's eligibility to sell $79 million of JPMorgan's stock for 18 months. Morgan Stanley (MS) has been cutting back, and Gorman's pay was not immune. He will get stock options, a deferred cash bonus and base pay worth $6 million for 2012, according to a person familiar with the bank's plans. He also received a long-term incentive plan valued at $3.75 million. All told, Gorman's compensation is down 7% from 2011, when he received a pay package worth $10.5 million. Morgan Stanley announced plans last month to eliminate 1,600 jobs, or 3% of its workforce, including "more senior employees." 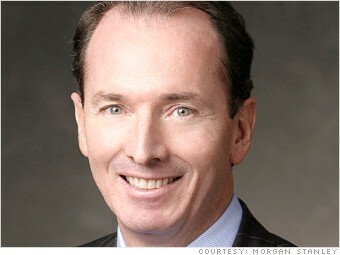 For 2013, Morgan Stanley has decided to hike Gorman's base pay to $1.5 million, up from $800,000.